Dad of Divas' Reviews: Saving Space with YouCopia! 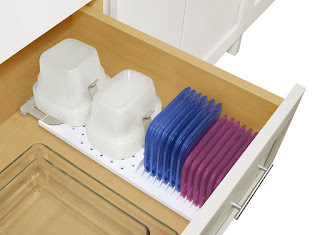 As so many of you know saving space is not something that tends to happen in a busy home. Things get cluttered, busy and crazy. Of course, the cabinets get even more cluttered. Sometimes, it seems that it is easier to just toss things instead of organizing them but before trying YouCopia, I did not have an easy way to do this. I recently tried the following products and am so glad that I did! 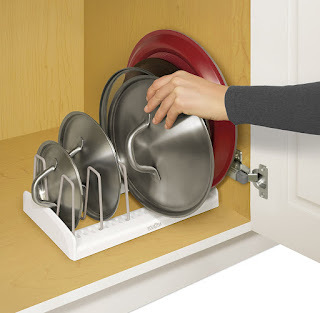 No permanent installation required; Expands to lock into standard kitchen drawers 18-5/16" to 21-5/16”D x 7-3/8"W x 4-1/2"
In using these YouCopia products I found that they were very easy to use and that they came together quickly too. I found that they fit well in my cabinets and I could easily fit my pot lids as well as my ziploc and rubbermaid containers and lids all in one place. These products really allowed me to get organized and the end result really made a difference in consolidating my space and making things look a lot better.